for domestic and suitable commercial premises providing they do not fall within a defined conservation area or upon a listed building. 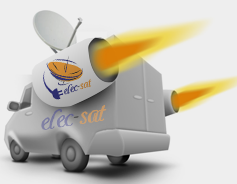 The installation service includes the following: the supply, installation and alignment of a fixed Satellite Dish or motorised system and, (if applicable) an appropriate satellite receiver supplied by us which is suitable for the reception of the desired satellite services. (e.g. Freesat Astra/Eurobird - dish size 64cm solid galvanised type or motorised 88cm dish). The installation of pre-supplied mounting brackets – site specific (wall mount). The supply and installation of a surface mounted downlead(s) to a suitable position for connection to the customer’s digital receiver (please note: additional rooms will require additional cables). All wall entry holes will be properly sealed against the elements using silicon sealant and appropriate internal/external weather covers. Carry out a final assessment of received services to confirm the new service is operational to agreed levels following the satellite dish system installation. Connection to your existing TV/associated equipment and demonstration. Tidy and vacuum the workspace on completion. The following situations are deemed as a non-standard installation and not covered under our installation agreement. Please ask us for more information if any of the following applies: three-storey properties, communal systems (flats generally), specialist cable management (channelling out, lifting carpets, hiding of cables behind partition walls, etc). We may quote additional charges for installations outside the scope of the standard conditions (example: special access requirements/specialist mounting materials/bespoke cable management), or for upgrading your option to a higher number of TV points. Your satellite dish installation is covered by a one year parts and labour warranty. All Triax galvanized satellite dishes and galvanised wall brackets (of whatever make) are guaranteed from any reasonable defect that may inhibit reception by elec-sat installation Manchester (UK). This is a parts only guarantee and site visits are still subject to our normal call out charge. All parts, if found defective, will be replaced free of charge. This guarantee does not cover broadcast changes, receiver problems, any additions or modifications made by any thirdparty installers, accidental or malicious damage, causes such as high winds, storms or lightning discharge, water ingress via damaged cable, nor does it cover loss or deterioration of signal reception due to causes external to the installation. Your statutory rights are not affected. We retain £2,000,000 of Public Liability insurance underwritten by Ulrich Insurance plc. This covers legal liability to pay compensation to third parties for personal injury or damage to property caused in the course of our business, or our products. The cover also provides protection against court attendance expenses upon us, defence costs for criminal proceedings brought under Consumer Protection, Food Safety and Health and Safety at Work Acts. Unless previously agreed, payment of all installations (jobs) is due immediately upon completion. Payment may be made by either cheque or by cash. Title to the goods supplied shall remain with the seller (Elec-sat) until such time as the purchaser makes payment in full for the goods supplied and for other goods supplied by the seller to the purchaser. Until title to the goods passes to the purchaser, provided the goods still exist and have not been resold, the seller (IsleSat) shall be entitled todemand the return of the goods and if the purchaser fails to do so, to enter the purchaser's premises or those of any third party where the goods are stored and repossess the goods.